It said on the packet that it was an annual, but it turns out it might end up a weed. Some say its beautiful flowers are among the few blue comestibles in nature. 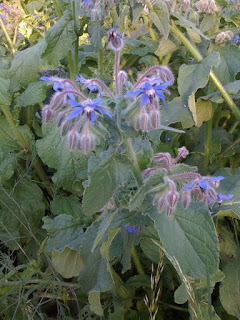 Borage oil is supposed to be good for PMS, skin diseases and a wealth of other ailments, as it is an excellent sources of gamma-linolenic acid (GLA). It is also called starflower, and it's growing beautifully... I do hope it's attracting insects (and not spoiling the asparagus) as I myself am not enjoying it at all, given that I barely had time to take this picture! It's one of the first things I will have to sort out once I'm back.